No computer on earth can come close to the complexity of our brain and the neurons (nerve cells) that send and receive communication. 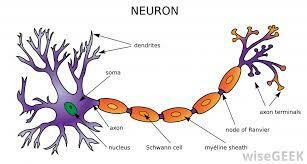 Of all the extraordinary cells that make up the human body nerve cells (neurons) are simply astonishing. While we know a lot more about the brain none can properly explain the near instantaneous nerve processes that allow thought and movement. There are two main divisions of our nervous system: Our Central Nervous System (CNS) which includes our brain, spinal cord and various processing and control functions and secondly our Peripheral Nervous System (PNS) which includes our cranial and spinal nerves plus the complex communications between the CNS and every part of the body. During my studies the part of neurology that fascinated me most is what happens at the junction (synapses) between nerves and other nerves, and between nerves and muscles. 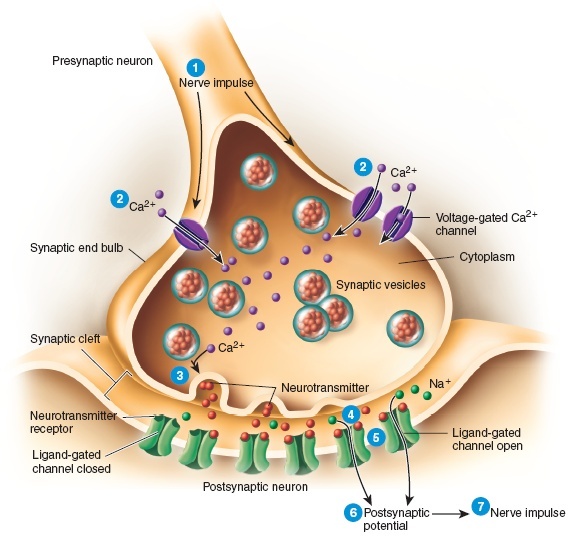 The following diagram explains what happens at the junction between synapses. You will see the most important role of calcium in the body to assist in the transfer of a nerve message across the gap between nerves. None more so than the eyes which uses these junctions to change light energy into chemical energy (neurotransmitters) which is converted to electrical impulses which are interpreted as sight and all at warp speed. You can see the role of neurotransmitters in the diagram – these literally carry the message of one nerve into another nerve. It just boggles the mind to think that light waves can change into chemicals which are then changed to nerve impulses that our brains then interpret. The eyes just pick up the light. The brain allows us to see. When working properly the seamless operation of thought processes which are then relayed to muscles for bodily operation are nothing short of miraculous. However when these complex systems fail as a result of injury or disease the outcome can be catastrophic. The most common diseases that damage the nervous system are Multiple Sclerosis, Parkinson’s Diseases and Alzheimer’s disease and Neuropathy caused by diabetes. Unfortunately the diabetes epidemic will also create a later neurological epidemic. If you are at risk of these problems it is very important to have a diet and lifestyle that helps to prevent disease. Feel free to contact me for suggestions. Each of these diseases seems to target both physiological and probably genetic weaknesses. While these diseases are classified as incurable there are many practical nutritionally-based principles that can have a positive impact on these debilitating problems, even if it is just an improvement in energy and general well-being. We start by briefly discussing Multiple Sclerosis. This is a CNS autoimmune caused by the destruction of the myelin sheath that protects and insulates some CNS nerve fibres. For some reason the body establishes a dysfunctional inflammatory immune response against myelin proteins. This changes functional myelin to useless lesions (scleroses) which cause a number motor coordination and other problems. Scientists are still debating the causes but there are generally accepted risk factors .These include low levels of vitamin D and some viruses especially Epstein-Barr Virus (EBV). These links were highlighted by D. Acheson and C. Hayes (2008) in a paper ‘A unifying multiple sclerosis aetiology linking virus infection, sunlight, and vitamin D, through viral interleukin-10”. The paper concluded that both low vitamin D and an inflammatory response to EBV are both plausible explanations to this destructive disease process. We do know that the twin destructive processes of inflammation and oxidative stress are involved. Basically the incorrect immune response increases production of highly inflammatory compounds, These then generate much higher levels of free radicals which damage myelin and other tissues. This is why optimising antioxidant defences is so important. Do a Google Scholar search for “Oxidative stress in Multiple Sclerosis” and see view the extensive research. Any disease that involves the over-production of immune system generated inflammation could in theory respond to targeted nutritional therapy. My approach to MS is to really throw the kitchen sink at it. It all starts with a careful diet. I like this to be low in carbohydrates, but including excellent sources like brown rice. It then needs a reasonably high fat content especially monounsaturated and Omega 3 oils. Some saturated fats especially coconut oils are good in moderation. Oily fish like tinned wild red salmon and our darker flesh species of trevally and kahawai are high in Omega 3. These should be the main non-vegetable protein source. We then add lots of vegetables- a huge variety. Forget 5 servings; try 10+ raw, cooked, blended (winter soups are great! )- Vegetables, vegetables and more vegetables. I start with my Cell-X broad spectrum vitamin/mineral/antioxidant complex then add very high doses of Omega 3 to get the EPA and DHA Omega 3 fatty acids known to influence inflammation. We then add a potent mixture of anti-inflammatory compounds and also target energy producing nutrients. These include OPC (grape seed extract) curcumin, resveratrol and others. Research shows that mitochondrial dysfunction plays a central part to MS. We add my MTQ10 which is a specifically formulated mitochondrial and neuro-supportive supplement. This includes B complex vitamins, Alpha Lipoic acid, N-acetylcysteine, Acetyl- l- Carnitine and Co-Enzyme Q10. Go to https://www.abundant.co.nz/products/mtq10/ to read more. Ideally anyone with MS or with a familial association with MS should have their vitamin D levels tested and should supplement to ensure they are at the top end of normal. I like to see MS clients with vitamin D levels in winter at over 100nmol/l. 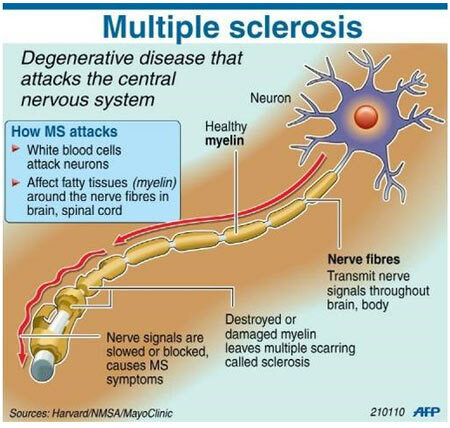 With MS, as with any disease of the nervous system I would rather a bit more than a bit less. Using my products I would start with Cell-X and Omega 3. I like to add my rapid absorption Magnesium formula to help relax nerves. Then we add vitamin D and the most importantly, the MTQ10. These, with a good diet would form the basis of a sound nutritional support programme. Generally the first positive response is improved energy.